In late January 1968, North Vietnamese forces and the Viet Cong launched a massive offensive throughout South Vietnam. Hurling 84,000 personnel at South Vietnam, the communists struck 36 of the South’s 44 provincial capitals and 100 cities, including Hue in the northern part of the country, Qui Nhon in the center and Saigon in the south. Timed to coincide with a Vietnamese holiday known as Tet, the operation came to be called the Tet Offensive. It was an unmitigated tactical-military defeat for the communists that turned into a strategic-political victory – and proved to be the turning point of the war. WHAT IT MEANT What began Jan. 21, with an artillery bombardment on the U.S. Marine outpost at Khe Sanh, exploded into an all-out offensive against the whole of South Vietnam nine days later, as most Vietnamese celebrated the Tet holiday. Hanoi’s choice of Tet was no accident. “The communists had proclaimed a truce over this period,” President Johnson later recalled. But North Vietnamese commander Gen. Võ Nguyên Giáp used Tet festivals and travels as cover for his audacious military-guerrilla operation. For Washington, it was a political disaster. Washington’s words couldn’t overcome the images flowing out of Vietnam – and worse, those words didn’t seem to reflect what was happening there. What the commander in chief and his top general in Vietnam were saying proved jarringly out of step with what happened during Tet. In the first 48 hours of the communist offensive, 232 U.S. troops were killed and 900 wounded. In and around Saigon, the enemy seized radio stations and police stations, bombarded the airport and presidential palace, and assaulted the U.S. embassy. Wearing South Vietnamese uniforms, Viet Cong guerrillas breached the embassy’s outer walls in the predawn darkness Jan. 31 and occupied parts of the embassy for six hours. The attack “stunned American and international observers, who saw images of the carnage broadcast on television as it occurred,” one battle history recounts. NBC News footage from the first day of fighting featured breathless correspondents shoving microphones into the faces of GIs in the midst of gun battles, GIs crawling for cover, GIs scrambling to retake the embassy, GIs bleeding and dying, Saigon in chaos – all transmitted into America’s living rooms. LBJ later criticized “emotional and exaggerated reporting.” Media coverage of Tet was not inaccurate, but it was incomplete – and strikingly different from coverage of World War II battles, which were equally brutal and bloody, equally chaotic and fluid. Imagine if World War II correspondents had beamed back images – virtually in real time – of the bloody beaches at Normandy and Okinawa, Allied squabbling and confusion at Sicily, the chaos and unpreparedness at Bastogne. Without filter or context, such images can have a devastating effect on public support and morale. Indeed, when the American people saw the images of communist forces laying siege to Saigon, they concluded that the commander in chief was either misleading them or out of touch. And when they absorbed the full costs of Tet – 3,895 Americans killed in what The New York Times called “the heaviest and most sustained” fighting of the war – they turned against the war. Although it was a military disaster for Ho, Tet proved to be a smashing political success; after Tet, LBJ abandoned his bid for re-election and Westmoreland was reassigned, bringing Ho closer to his primary objective. “Ho Chi Minh thinks he can win in Washington as he did in Paris,” LBJ warned in 1967. He was right about Ho, and Ho was right about his read of American politics. 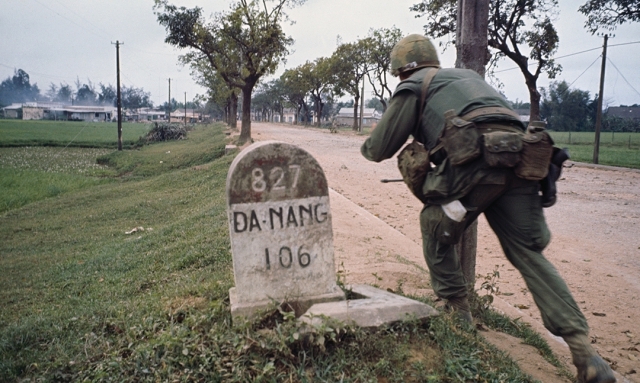 WHAT IT STILL MEANS Vietnam was called the first “television war.” Tet illustrated how powerful and corrosive this new medium could be for a representative democracy at war. In an age of instantaneous communications, images matter more than body counts or battle damage assessments (BDAs), more than statistics or metrics, more than congressional testimony or Oval Office addresses. When the images don’t match the message, public support can erode rapidly. Thus, our enemies have become quite skilled at using media and media images to target the American people. Consider Iran’s humiliation of American hostages, Muammar Qaddafi’s claims that some of his children were killed and wounded by U.S. airstrikes, Iraq’s guided tour for CNN cameras of a bombed-out “baby milk plant” during the Gulf War, the beastly treatment of America’s fallen in Mogadishu, footage of snipers and IEDs killing U.S. troops in Iraq, and the beheadings and butchery livestreamed by al-Qaida and the Islamic State. Alan W. Dowd is a contributing editor for The American Legion Magazine.